* SHINY TRAIL * by JL is a ribbon ladder yarn. It has spaces between the ribbons, giving it a ladder trellis effect. 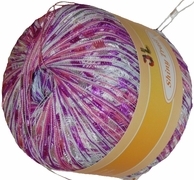 Knit in alone or combine it with other yarns. It adds a bejeweled effect to any project you are knitting. 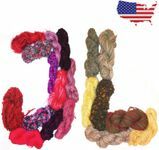 Suitable for making scarves, sweaters, vests, tops, purses and the ever so popular ladder yarn necklace.